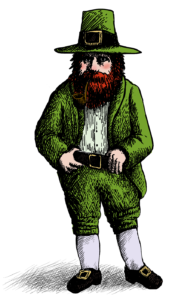 Leprechauns are one of Ireland’s more famous characters from Irish folklore. They have become renowned all over the world. The mischievous Irish Leprechaun has captured the imagination of millions of people over the years. With tales from some of how they’ve sighted these wee folk in the Irish countryside. The Leprechaun is part of Irish mythology and folklore that fall under the topic of the Faerie folk, also known as ‘wee folk’ or the ‘little people’. They are members of the Tuatha Dé Danann who invaded Ireland and were banished to live under ground. Standing 2-3 feet tall, leprechaun’s are a devious character who are quick-witted, highly intelligent, and will do anything to evade capture from humans. As a cousin of the Clurichaun, the Leprechaun is known to inhabit Ireland before the arrival of the Celts and can survive hundreds of years. Some consider leprechaun’s to be the true natives of Ireland who are descended from Irish royalty. The Leprechaun can only be found in Ireland, in rural areas away from the general population. Burrowed deep in underground caves with entrances hidden as rabbit holes or found in a hallow trunk of a Fairy tree they find safety away from humans who seek to capture them to be granted 3 wishes. The Leprechaun is well-known for their love of Irish music and traditional dance. They’ll often hold Celi’s that can last for days. They are expert musicians when it comes to playing the tin whistle, the fiddle, Bodhrán, and even the Irish harp. Yeats goes on to tell the story of a woman who had been spirited away by the Faeries and had been returned seven years later, minus her toes. She had danced them off! You’ll hear an Irish Leprechaun before you’ll ever see one. If you’re ever out in the rural countryside and hear a tap, tap, tap, it’s usually the sound of them hammering nails into the soles of a shoe. But try to find whoever is making the noise is next to impossible. There is a misconception that leprechaun’s are drunkards however; they do have a fondness of drinking Irish Poitín. It would be unfair to mistake them for their Irish cousins the Cluricauns, a drunken creature who loves to cause chaos around Ireland during the night. Catching one of the wee folk is no easy task and it’s often discouraged. They’re quick, smart, and have magically powers to vanish into thin-air but they can be caught. It’s believed that if you’re lucky enough to catch a Leprechaun he’ll grant you 3 wishes to be released but be careful, making the wrong wish could result in a life time of bad luck. People do tell stories of their experiences in catching a Leprechaun and getting their 3 wishes granted but be cautious of such claims, people tend to tell fibs and how they’ve caught them. 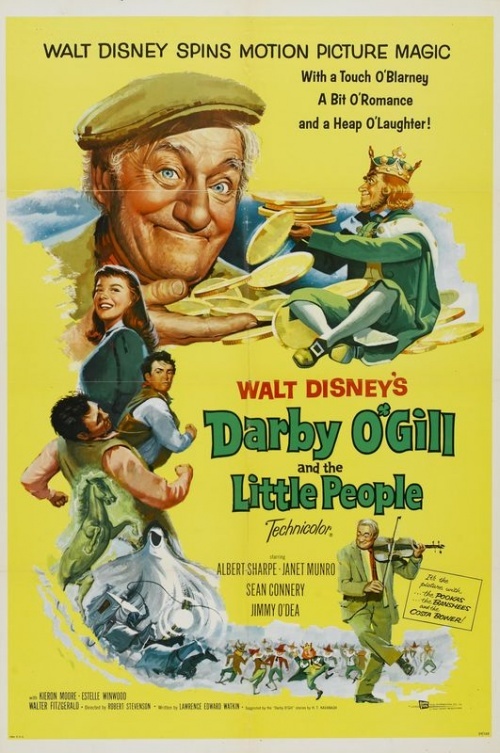 Without a doubt Darby O’Gill and the little people is the most famous and loved movie describing how leprechaun’s live in Ireland. Starring Sean Connery, Janet Munro, and Albert Sharpe, it’s a movie full of Irish folklore, songs, and dancing. If you’ve never seen Darby O’Gill it’s highly recommended and is no doubt one of the classics for most Irish families.